William Butler Yeats poetry and his love of Irish mythology, folklore and song inform the writings of Tony Cuckson. This poetry, myth and song are interpreted for modern minds and for practical everyday living with purpose, peace, prosperity and Presence. Move to those sections of the page that most interest the reader. In order to move to different section headings simply click on the heading link and you will be taken to that section of the page that you are interested in. The Power of Poetry, Myth and Song. The Power of Irish Blessing. Other Information about the Author. Poetry, storytelling and folksong are written from the language of the heart. This is the language that each one of us must learn if we are to find purpose, passion and true prosperity. This language invites you to listen from the deep heart’s core. (The Lake Isle of Innisfree). This language of power educates you in the true sense of that word. Educate means, “to bring out.” You learn how to bring out and express your true self. I wish that when you are lonely and in darkness that I could show you the magnificence of the light of your own being – Hafiz of Shiraz. The poems, stories and songs shared here are not simply more information. They are shared by way of invitation to transformation. Transformation is an experience of the heart. It is a direct experience and not simply intellectual understanding. It is an experience of communion rather than communication. It is a direct experience of a dimension that cannot be known by the intellect. The Personal with the Universal. The finite with the Infinite. The poetry that is central to this site is the poetry of William Butler Yeats. The sharing here is not academic. It is from a love of the language and the power of language to make a positive difference in the lives of others, especially the school children of Ireland and beyond. The Song of Wandering Aengus. He Wishes for the Clothes of Heaven. These will form the material for the forthcoming book A Journey with Mr. Yeats – 10 Poems for Companioning YOUR Greatness. In this site I share the power of Irish mythological storytelling. These are not just old Irish stories that you read and then forget. These are stories that invite transformation. They invite an understanding of who you are and why you are. Many times man lives and dies between his two eternities. That of race and that of soul and ancient Ireland knew it all. – From Under Ben Bulben. The central story shared here is the story of The Four Treasures of Ireland. 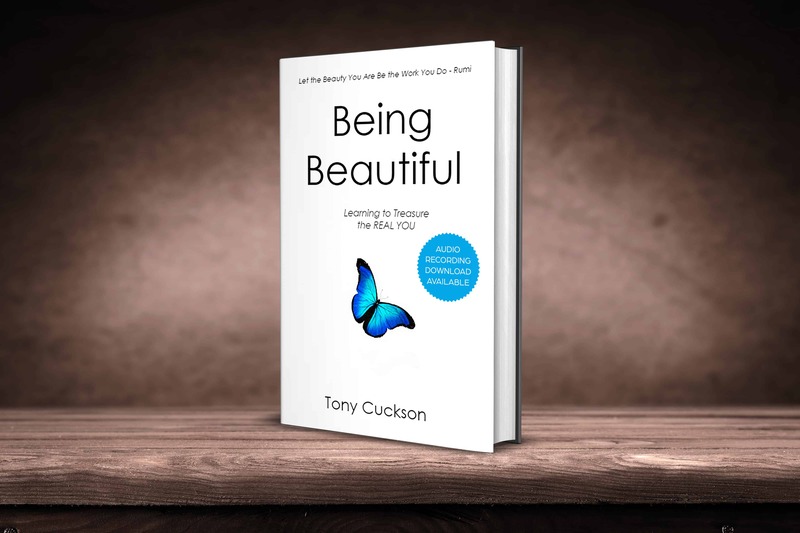 This story is shared in detail in my book entitled Being Beautiful – Learning to Treasure the REAL You. Again, as with the invitation from the Power of Poetry there are outlined the practices that you can engage with in order to experience what it feels like to live as one of the Beautiful People. How does it feel to be one of the beautiful people now that you know who you really are? – Lennon and McCartney from Baby You’re a Rich Man. It is the intention of this writer to share the songs that he has journeyed with and which invite what he refers to as the I AM of Ireland experience. These are folksongs and modern-day songs connected to poetry and myth that will invite you into the holy experience of I AM. In this way you learn how to become what the poet Rumi calls, “Living poetry.” You become one of the Beautiful People who shine their light into the world acknowledging that they are blessed and can bless. Sharing the poetry, mythic stories and songs of Ireland are the way in which I feel blessed and can bless. That is its intention. As a storyteller, writer and folk singer let me share with you a personal story. 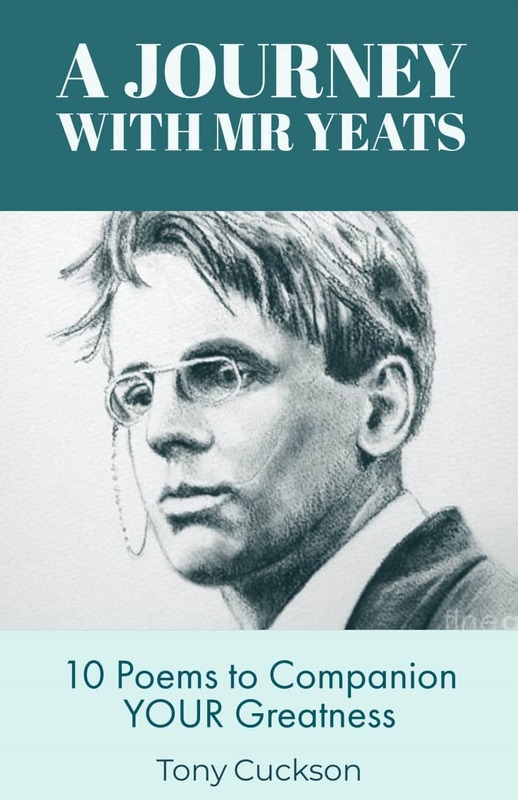 This is the rather magical story of how my Journey with Mr. Yeats began, moved on and continues. I was fifty years old when I received another Call to Adventure that would change my life. It would lead me to return to Ireland, face and experience of addiction and become amongst other things a storyteller, a writer and a singer of heartsong and Kirtan. I would leave England were I had lived for more than thirty years and leave behind a life dedicated to accountancy and taxation. Had anyone told me this one year before I would has said they were living a life of phantasy. So I trained as a councillor and returned to Ireland with the vision of creating what I called The Still Point Centre. The universe had other ideas. The Journey with Mr. Yeats began on the morning when I left our home in Leeds to go to Ireland with the view to buying a place to live. As I started the car to leave the radio came on. There was a song playing that I vaguely recognized. I listened to it with a deep curiosity. At the end of the song the announcer declared that the song was entitled The Lake Isle of Innisfree by the Irish poet W.B. Yeats. This happened to be my mother’s favourite poem. Barbara and I travelled on. We drove toward the West of Scotland through the English Lake District toward the port of Stranraer. There we would catch a boat sailing to the port of Larne on the East coast of my homeland in Northern Ireland. Having had two synchronistic events happen in relation to my journey with Mr Yeats – hearing the song The Lake Isle of Innisfree and travelling on the boat named The Lake Isle of Innisfree we travelled on. The plan was to travel to Co. Clare and look at properties, one of which we might buy. It wasn’t to be. We ended up in the town of Manorhamilton in Co. Leitrim and discovered that properties there were about half the price of those in Co. Clare. Feeling excited we travelled onward through what is called Yeat’s country to the town of Sligo. There we went to a hotel and looked through the property brochures which we had acquired from various auctioneers in the area. When we left the hotel my eye caught the sign showing its name above the door. The name of the hotel was The Lake Isle of Innisfree. It seemed that this was confirmation that we were meant to be here or thereabouts. 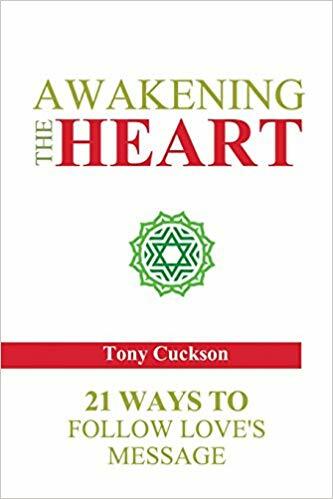 Many years later having become a writer, storyteller and singer of heart songs I was arranging to play some Kirtan at a festival. It wasn’t working out so I cancelled the gig. As it happened my sister Gillian came down that weekend. We all ended up in the great hall of Lissadell House outside Sligo. It was, unbeknown to me, the weekend of the 150th anniversary of the birth of W. B. Yeats. Lissadell House was full. With others we stood in the great hall before the marble pillars. We were waiting the scheduled arrival of a group of poets who were to read some of the poems of the great man. The troupe of poets had not arrived so the compere asked the audience if there was anyone in the room who would like to come to the podium and read a poem by W. B. Yeats. One man ventured up and read from a pamphlet one of the poems included therein. I cringed. Then another man did the same. The scheduled poets had still not arrived so the compere asked for someone else to come to the podium and read. Barbara poked me in the ribs and said, “You should go up and do a poem.” I hesitated. Then my sister Gillian encouraged me. That was enough. I stood on the podium before the marble pillars in the grand hall of Lissadell House where W. B. would have spent many a weekend. There he commemorated the house in his poem In Memory of Eva Gore-Booth and Con Markievicz. Lissadell House was the family home of the Gore-Booth family at the time W.B. Yeats lived in Sligo. There he might have met with a fellow county man from Armagh who was the painter and mystic George Russell (AE) one of whose painting is on a wall in the living room. I recited my favourite poem The Song of Wandering Aengus which I know by heart and which my heart loves. The crowd loved it and the compere asked for more. So I recited my mother’s favourite poem. This was The Lake Isle of Innisfree. Standing before the marble pillars in the great hall of Lissadell House I felt I had come full circle. Later people came up to me and asked if I had a recording of my reading W. B. Yeats poetry. I replied that I felt flattered that they would ask but that I did not have such a recording. I left the house and grounds feeling elated. 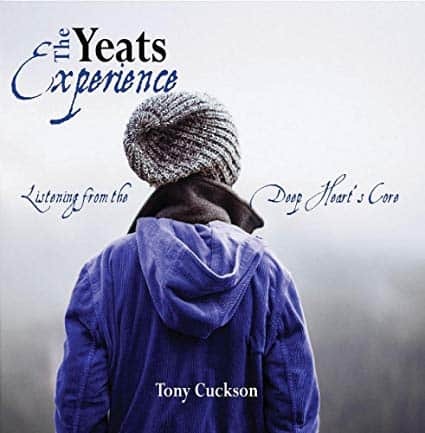 Later that year I produced a CD of W. B. Yeats poetry entitled The Yeats Experience – Listening from the Deep Heart’s Core. Now I have come to that place where I am compiling this book of 10 favorite W. B. Yeats poems. It is done with the hope that in reading these poems, and practicing the steps for the journey, that you learn to Companion YOUR greatness (These are the Clouds). Then you may be graced to know that in the words of W. B. Yeats, “I am blessed and I can bless.” (Vacillation IV) Let it be so for you. Let it be so for all. This page is about me, Tony Cuckson writer, storyteller and folk singer. However, it really is more about you. It is the invitation to Companion YOUR Greatness. When you do this you will learn to feel blessed. Out of this expansive feeling of blessing you will bless others. You will live as one of the Beautiful People who have claim The Four Treasures of Ireland. You will live as a Cauldron of Plenty (4th Treasure) pouring forth the gift of Being your Self. It is my hope, and my wish that you enjoy and inspired by the poetry, myth and legends of the Holy Land of Ireland. This is so that you walk the Beauty Way and know that you are magnificent beyond measure. Then I have my wish. I have to some degree satisfied my heart in its longing. Via the magic that is the internet I invite you to, metaphorically speaking, to dance with me in Ireland by way of updates to learning HOW TO Companion YOUR Greatness. In this way you learn, in practical ways, through poetry, storytelling and songs of Ireland to know and live the magnificence that is the light of your own being. Simple fill in the form to the right. Let me begin to leave with a favourite Irish Blessing that invite the alignment within you of the elements of earth, fire, water, air and ether. This then allows you to feel whole and go dancing in the Holy Land of Ireland. This is a blessing for the road that is “Your one wild and precious life.” (Mary Oliver) May you have the courage, faith and patience to follow the signposts that take you home to your true homeplace. A Place of Stones – 10 Stories for Companioning YOUR Greatness. For Talks, Concerts, Workshops and Courses on the poetry of W. B. Yeats and The Four Treasures of Ireland contact Tony either by email or at the address given below.